It has been soo long! My life has been so busy recently and I haven't had much time to blog. So I thought for my first post 'back' it would be good to do a little review of a product that I have been getting a lot of use out of while I have been in 'La La Land'! 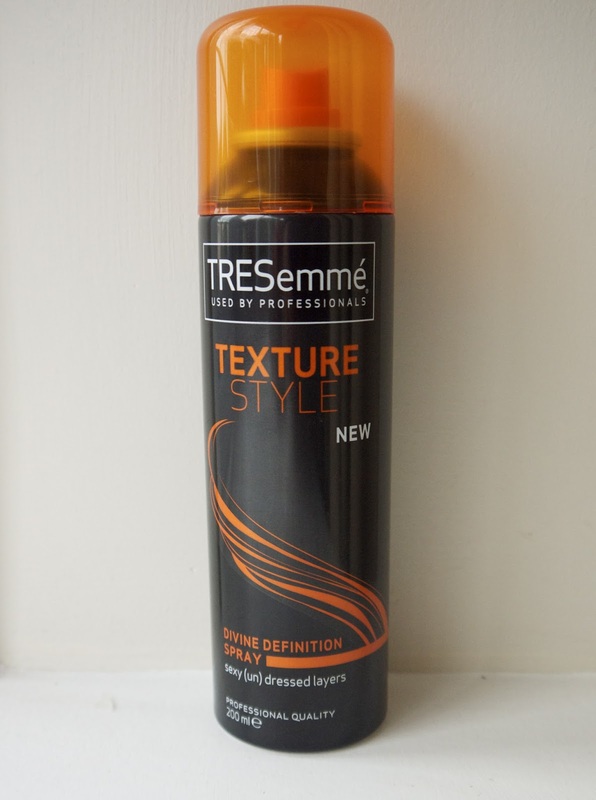 This little wonder by Tresemme is their Texture Style Divine Definition Spray. I mentioned this a couple of months ago in a haul video and have been loving it so much that I am going to have to go out and purchase another! I am not the biggest fan of hairspray. I know many people who use it as their everyday hair essential for voluminous locks. However, for me, I haven't found one that leaves my hair in a condition that I am happy with - I like soft, bouncy hair which I haven't had any luck achieving with hairspray. Enter the Texture Style spray. I use this on my hair after I've straightened/blow dried my hair and it provides me with a natural-looking extra 'umph'! (I hope that makes sense!) It sort of achieves imperfect perfect; a hair look that is flattering and looks effortless. I have so much love for this product, and I am sure I will get even more use out of it in the coming Autumn/Winter months!